Our team handles commercial roof repair for clients in and around Angus. When you own or manage a commercial building, you have a number of tasks on your plate. Building maintenance is often at the top of the list, especially if something isn’t working properly. A damaged roof on your commercial building can lead to a number of issues, including water damage, an infestation of pests, and trouble managing the interior temperature. When you’re facing a problem with your roof, it’s best to leave the commercial roof repair to our professionals at Slippery Slope Roofing. We specialize in commercial service, with experienced team members who know how to handle repairs on buildings of all shapes and sizes. You might notice some signs that you need commercial roof repair. If you spot patches of light coming through the ceiling on the upper level of the building or have trouble keeping the interior temperature comfortable, these can indicate a problem with the roof. Our team members can examine your roof to look for areas that are in need of repair. If we spot areas that need to be patched, we can use matching shingles to make the entire roof look more uniform and visually appealing. 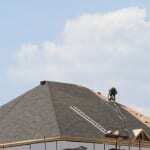 When you rely on us at Slippery Slope Roofing for your commercial roof repair in Angus, Ontario, you’ll get a team with more than 50 years of combined experience in the industry. We also work with integrity, giving honest estimates at reasonable rates to help commercial building owners as they budget for roof repair services. At Slippery Slope Roofing, we offer high-quality commercial roof repair services in Angus, Barrie, Orillia,Bradford, Alliston, Newmarket, Midhurst, Cookstown, Beeton, Innisfil, Collingwood, Wasaga Beach, Oro-Medonte, Midland, New Tecumseth, Clearview, Bradford, Essa, Stayner, Springwater, and surrounding areas of Ontario.